Revamp your interior and give your room five options towards a refreshing outtake on walls as we borrow designs from our very own home. Skirts, shirts, shoes, neck ties! I’m dehydrated from this intense cold wave; my vision is impacted and now I’m seeing spots! Or can it be that polka dots made a comeback and wormed their way not into the hearts and wardrobe of children but adults as well? I’m sure this news is awesome and welcomed to many of us as this fashionable life sized freckle pattern can be easily dressed up or down, made young or old and always encourages spontaneity and carefree skipping through the parking lot. 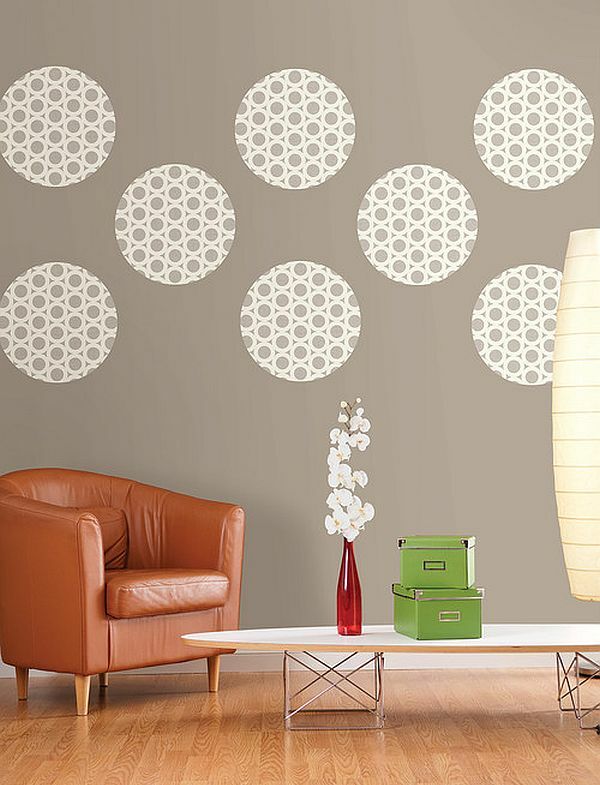 By having different sized dots and even hollow painted circles you can add an easy and accessible way of enhancing your living quarters with shape, size and the illusion of depth and dimension on your walls. Thanks to Janell Bealks for the great ideas and for this posing cutie!! Most rooms have only four walls and one ceiling, and since Candy Land is just a game we try not to paint each panel a different color from opposing sides of the color wheel. But you can live out your wildest color fantasies with multiple colors of polka dots. This is your chance to subtly mix in a new color introducing to your décor palette some flavor with no overbearing consequences. Lighten a dark wall with some white polka dots or darken a wall with bold hues. 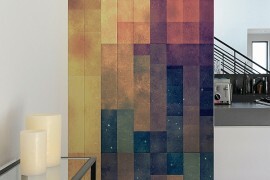 Make it the backdrop on one wall or even the ceiling. 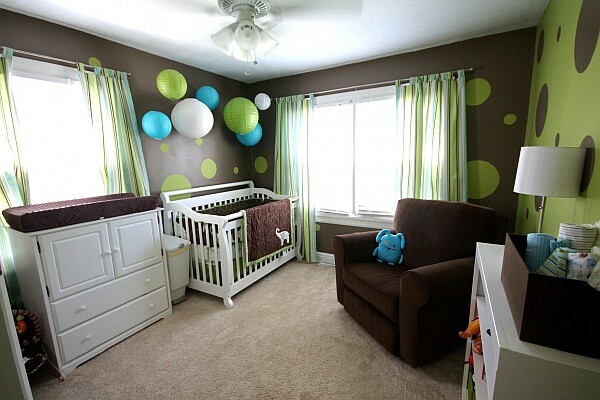 This can be a fun and more affordable way to giving your room an accent color to your solitary tone with circles that will present contrast and a point of interest. 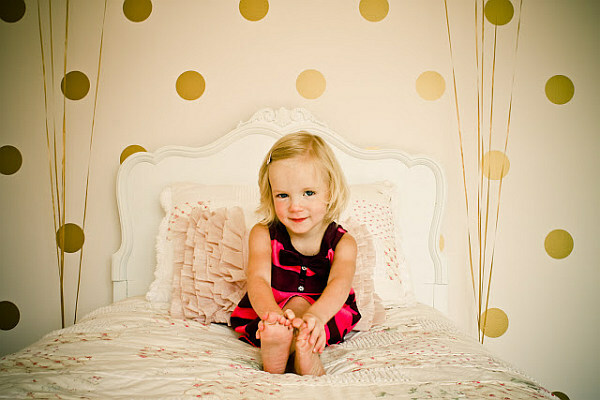 The smaller and more spaced out the more refined your polka dot wall will seem. Keeping these small spaced out polka dots in a uniform and tame pattern the more refined as well. This approach is great for a Victorian theme as the backdrop to your scrolled, velvet tufted furniture. 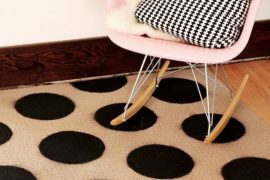 For a modern and more eclectic vibe apply the dimension, color and contrast the polka dot has the power to lend. Overlap them, create patterns within your polka dots give them liberty to be any size or color they want and your work and living room just shaved off ten years and is truly a 2012 baby. Now that you have an appreciation for the new wall accessory you can give a shot at it yourself with some DIY wall dressing. Cutting a portion of a laundry basket that features circular ventilation holes. 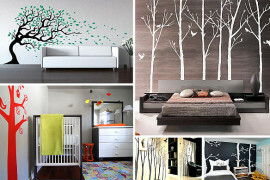 Using this as your stencil tape in place on your wall and paint over the plastic basket. As you move along your wall move your stencil so that at least one row of painted dots is centered in the end of your stencil to keep appropriate spacing. Although you have so many options on how you can add these charming polka dots to your wall they don’t have to be symmetrical, the same size or even filled. The beauty of the polka dot is in its forgiving style. Once you finish and it all dries you can announce to your Bohemian dance and music loving friends that polka night is back and your walls are now singing to the tune of dots!